It is a popular way for you to get around the city. Currently Guangzhou has more than 16,000 taxies running in the city. Different taxi companies are represented by different colored cars. Fares start at 10 RMB for the first 2.3 kilometers; each additional kilometer is 2.6 RMB.The taxi hot line is 96900. A trip to Canton Fair from Baiyun International Airport normally costs around RMB 160.00. Taxi Hotline: 96900 / 96122. Guangzhou Metro opened in 1999. 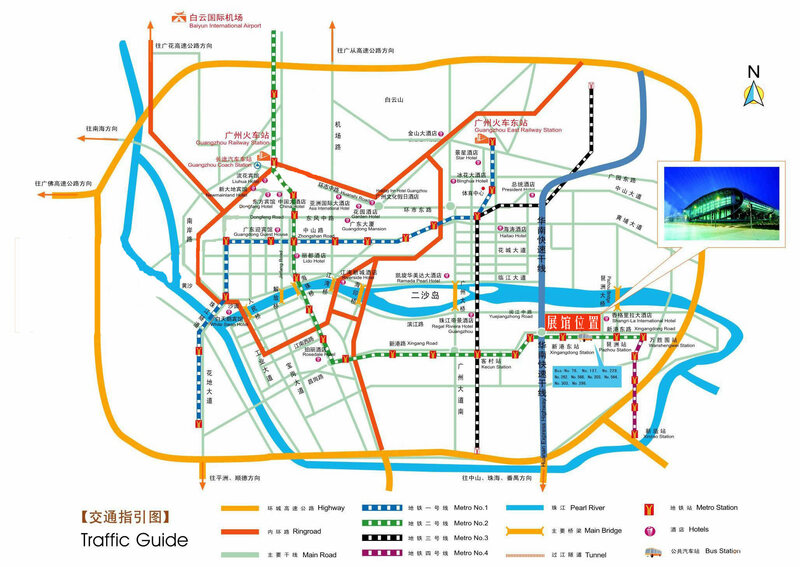 The network covers much of the city center and is one fo main transportation vehicles in ― Guangzhou. The fare ranges from RMB 2 to 12. Most of the signs and announcements are also in English. Tickets are bought from vending machines in the stations. Bills from RMB 5 ―10 or coins from RMB 0.5 ― 1 are accepted at ticket vending machines. Smaller bills can change at the customer service counter. The ticket is a small plastic token, which use at the gate entering the platform, and at the exit. If you take Line 1 first, please get off at Gongyuanqian Station and transfer to Line 2 (To Guangzhou South Railway Station). Then get off at Changgang Station and transfer to Line 8, get off at Pazhou Station and go out through Exit C.
If you take Line 2 first, please get off at Changgang Station and transfer to Line 8, get off at Pazhou Station and go out through Exit C.
If you take Line 3 first, please get off at Kecun Station and transfer to Line 8 (To Wanshengwei). 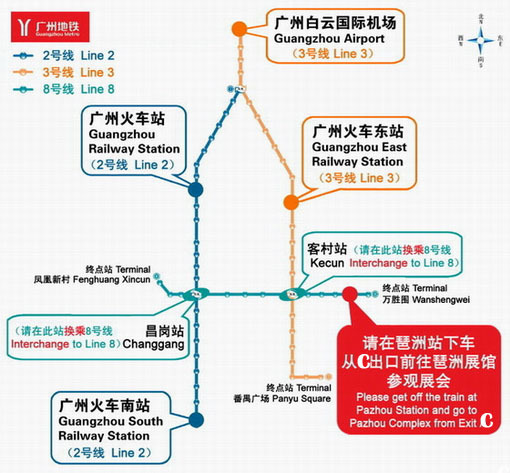 Then get off at Pazhou Station and go out through Exit C.
If you take Line 4 first, please get off at Wanshengwei Station and transfer to Line 8. Then get off at Pazhou Station and go out through Exit C.
There are two ways to get to Canton Fair, if you take Line 5 first. 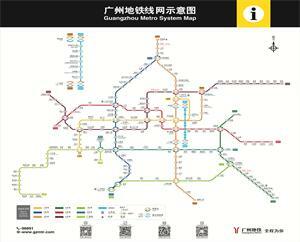 Firstly, please get off at Zhujiang New Town Station and transfer to Line 3 (To Panyu Square). 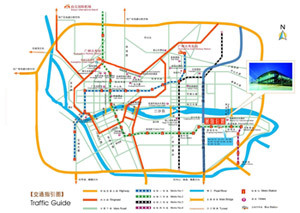 Then get off at Kecun Station and transfer to Line 8 (To Wanshengwei), get off at Pazhou Station and go out through Exit C.
Secondly, you can get off at Chebeinan Station and transfer to Line 4 (To Jinzhou Station), get off at Wanshengwei Station and transfer to Line 8. Then get off at Pazhou Station and go out through Exit C.
If you are close to Line 8, please get off at Pazhou Station and go out through Exit C.